No sooner do we arrive in Cannon Beach than The Child wants to leave. 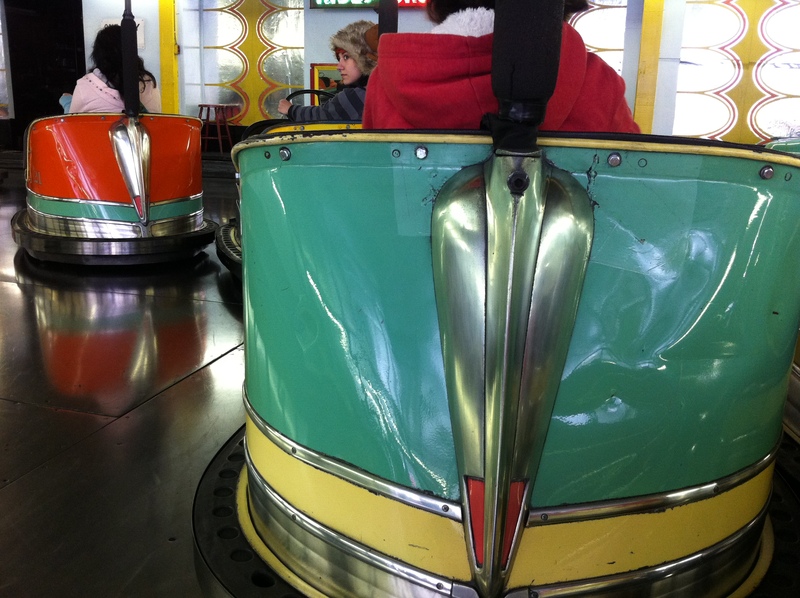 She wants to go to Seaside, she says; she wants to ride the bumper cars, and the tilt-a-whirl. So we go, getting a late start, and they are both as wonderful as we remember. Maybe a little more wonderful, because there are so many details I never saw before, or possibly just didn’t remember them. Also, we’ve both gotten a lot better at steering the bumper cars. We head back to Cannon Beach, and go looking for our favorite crab cake restaurant, but it’s gone. In its place is a Mexican restaurant which looks hopelessly out of place in the little beachy cottage: it’s not that you can’t do burritos in a beach town, but this place says come in, sit down, and listen to the traditional Mariachi band – and I’m on the Oregon Coast, with kites to fly and hikes to take. It just doesn’t work. We skip it – partly because of the Mariachi thing, but mostly out of spite because of the crabcake place that is no more – and instead head for a place in an old lodge made out of logs and river rocks. It’s very pretty inside, yet they make possibly the worst French fries ever. We vow to eat in more. The next day, I get up, and sit quietly reading. All morning. The sun comes for a brief visit; the clouds return. I decide I’d like to catch the weather while it’s still halfway decent, but The Child is still sleeping soundly. I make a simple breakfast of eggs, toast, and fresh strawberries, and serve it to her in bed around noon. The Child is thrilled to get breakfast in bed, and eats the bread but not the crusts, and then the strawberries, and after telling me that the eggs didn’t taste the same as eggs at home, she announces she’s ready to go. We head for the beach, taking The Dog with us. He is baffled by the beach – although he’s been here before, he clearly doesn’t remember it. He walks along, not too slowly, but also none too fast, stopping frequently to lift his snout into the breeze and sniff deeply. Sometimes he looks at me, rather perplexed by the whole thing. He starts to limp a bit on one foot, so we turn around and take him back to the condo. The afternoon is slipping away, and there’s a yarn store in town that I really want to go to. Local Oregon yarns. The Child wants to walk on The Beach some more, but I nix the plan. I want yarn. She sulks in the car. I promise her a trip to the old-timey pink-striped candy store afterwards, which improves her mood, but only marginally. At the yarn store, the child selects a craft kit within a minute, while I begin the lengthy decision making process involved in choosing yarn. I can’t decide. I circle the store twice. The Child is annoyed. I select two huge hanks of locally dyed yarn that will be good for a project I have in mind, and the shopkeeper offers to wind it for me. It’s a lot of yarn, and I know I will ruin it if I try to do it myself. It may take a while, she says. I suggest perhaps we should go to the candy store and get some taffy while she winds. Everyone likes this idea, and if memory serves, taffy choosing takes at least as long as yarn winding. We head over. There’s a photo booth set up outside, complete with props. I stop to check it out, while The Child goes to the door. Then she comes rushing back again. It’s a party, she says. It’s the store’s birthday party. I look in the window and notice that where the taffy machines usually are, there are huge ice buckets filled with bottles of wine, and tables laden with cheese. Can we go in? I ask the woman at the door. We just want some taffy. Of course, she says. Everyone is invited to the party. We wait five minutes, and the doors open. We’re first on line, and everyone greets us. The Child wanders off, then rushes back a moment later. Mommy, everything is free, she says. I think, this can’t be right, so I walk up to a man behind the counter and inquire, hesitantly: I know this sounds silly, but my daughter says everything is free? That’s right, he says. What would you like? I’m a bit perplexed, so he continues, would you like to come behind the counter? You can pick out what you like. I’m still thinking I must be missing something, but the man hands The Child a tissue paper and shows her how to scoop popcorn out of the machine. Then he shows us the gummy candy bins, and the chocolate cases. The Child gleefully helps herself. Gummy strawberries are delicious, she says. Cheese popcorn is better than caramel corn. She is rushing about, tasting something from this bin, something from that one. I’ve never seen her eat so much, with so much gusto. A crowd starts to form on the wrong side of the counter, but everyone is polite, and happy, and no one has trouble getting the sweets they want. I sample a chili pepper truffle, because I don’t want a lot – just one memorable thing. The Child finds some gift boxes behind the counter, and asks the man, can I fill one up and take it? No, he says. But he’s still smiling: But, you can have whatever you like while you’re still in the store. She’s finally had her fill, so we decide to head out. She takes a few more gummy strawberries, and I take a three pieces of taffy: Root Beer, Sour Apple, and Pomegranate. We go pick up my yarn, and then walk slowly back to our car, unwrapping candy as we go. I feel like we are luckier than we used to be, I say. We’re very lucky, says The Child. Ha Ha ! Bet my kids would think they were lucky too if stuff in a candy store were free !! Good Choice 😉 !! Enjoy the rest of your vacay !! There is no luck better than that of a kid in a free candy shop!